The Gwynedd team is one of several clubs across the country who demonstrate and compete at shows throughout the summer. 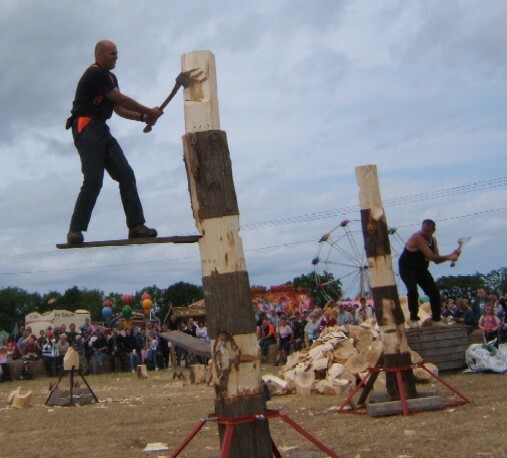 Some of the main competitions are held at the Royal Welsh Show in Builth Wells, the Devon County Show, the Royal Show and the New forest Show. Phil is a member of the Gwynedd Axe Racing Team. 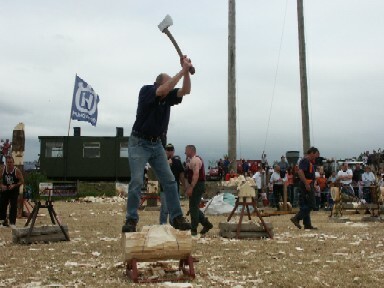 Axe racing or wood chopping is a sport in which competitors chop or saw through 30-50cm logs against the clock and each other. In developed as a sport in Australia and New Zealand in the 19th century where logging was a major industry. 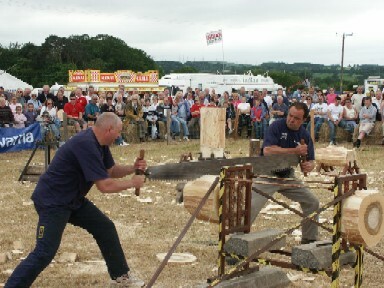 The loggers and bushmen would gather at fairs and challenge each other in competition, using the skills and techniques of their everyday work. 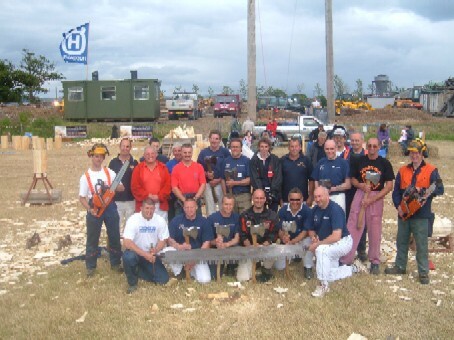 The Austalian Axeman's Association was founded in the 1880s and the sport has continued to flourish, spreading to Canada, the USA and more recently, to Britain. 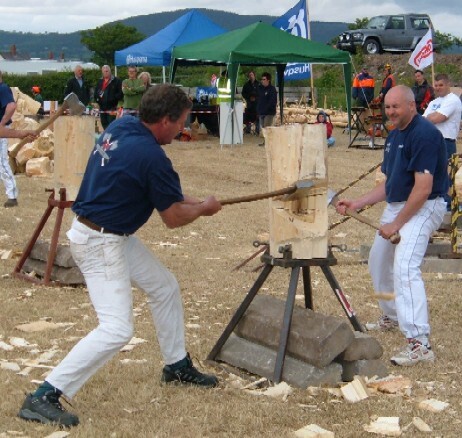 Axe Racing is a sport which requires precision and stamina and, unlike most physical sports, it can be pursued at the highest level for a long period of one's life. If you remain fit and healthy, there is no reason why you still can't compete and win when you are past the age of 70! The axes and cross cut saws used for racing are hand made in Australia and New Zealand. They are precision ground, polished and honed to a razor's edge. A new axe costs �0 - �0. Phil winning a two board tree-climbing event at the WoodFest in St Asaph, North Wales, June 2005.